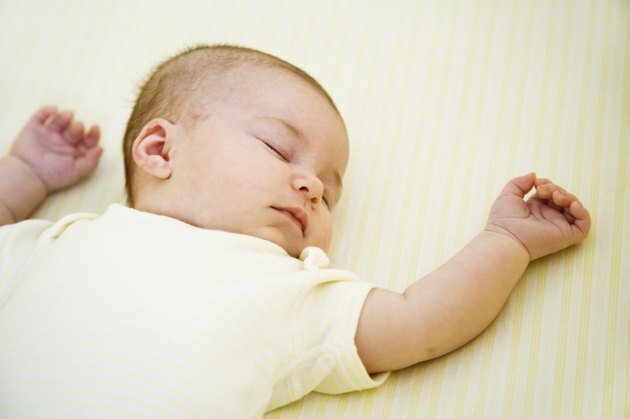 Is a Polyurethane Foam Mattress Pad Safe for Babies? Babies spend a large part of their days sleeping and thus spend much time exposed to what might be in a mattress pad. Parents must choose wisely to pick a pad made from a safe material. Polyurethane foam contains chemicals that may adversely affect a baby's health. Polyurethane foam has been one of the materials for crib mattress pads for many year but questions remain about its safety. Evidence shows that it isn't the best material for a baby to sleep on, with health hazards eminently present. Polyurethane foam is no longer deemed safe for babies, as shown by a study published in Environmental Science & Technology. The manufacturing of polyurethane foam starts with a petroleum base. Various chemical processes create the final product and the chemicals are still in the final product, which a baby continuously breaths when sleeping on a polyurethane foam mattress pad. According to Healthy Child, typical chemical additives may include formaldehyde, benzene, and toluene. Additional chemicals this material are classified by the EPA as hazardous air pollutants. Polyurethane foam is a highly flammable material. This means that the final product must be again treated with chemicals in order to make it fire retardant. These chemicals have been linked to Sudden Infant Death Syndrome (SIDS), according to New Zealand scientist and chemist Dr. Jim Sprott and as reported by Healthy Child. Sprott's assessment is based in findings that chemicals leach from the material and can combine with certain fungi found in bedding to produce poisonous gases. These gases go undetected in a normal autopsy. Numerous health hazards are now associated with the many chemicals found in polyurethane foam. These include issues with the heart, lungs, throat, digestive system, development and growth. Aside from these chemical issues, polyurethane foam also has a tendency to break down over time. This causes a dust that is likely to cause respiratory issues, or to aggravate existing issues. Though no one solution is deemed to be the best, alternatives to polyurethane foam mattress pads are available. Healthy Child Healthy World suggests an organic wool mattress pad, for its natural flame retardant properties, for its moisture wicking ability, and for being chemical free. Organic materials are generally considered to be safest. A crib death prevention campaign in New Zealand claims a 100 percent success with wrapping crib mattresses in a specially formulated material made from polyethylene, so this is another safe alternative. Overall, parents are advised to research and to know what is in any mattress pad they choose to buy. Jennifer Thompson started editing for her own online business in 2001, then began online editing and writing for others in 2005. Her articles have been published with "Sportsman's News" on Fox News and for a number of other successful ventures. Can I Safely Stain or Paint a Baby Crib? What Mattresses Are Best for Side Sleepers?